Last week, I finally, finally, finally hired some professional painters to get rid of the terrible, DIY paint jobs that the previous owners left behind. Seriously — before the paint job, my house was a cave of darkness. It was where natural light would go to die, with its dark maroon-brown living room walls and an almost-black stain on the wood paneling in the dining room. I’ve brightened the place up considerably with much lighter colors like a neutral white, a light gray, and a pale yellow. The place is so much brighter already and looks three times as big! This marks my first “major” renovation as a homeowner. And I must say, my inexperience definitely shown through — for instance, I had no idea that it was best to let paint dry in warm temperatures. Okay, I know that it sounds intuitive when I write that now, but at the time I thought it was best to leave the windows open to get some fresh air and ventilate the place. Who cares if it was 30 (F) degrees outside! Better than breathing in toxic chemicals, right? So with this logic, my housemates and I suffered through the first night of the paint job with the heat off and the windows open all night in below-freezing weather. Imagine my amusement when the painters walked in the following morning and promptly cranked the heat up on high. Oops. Not to mention the email from one of my housemates demanding I give him a space heater. Double oops. On the second day, there was another mild bit of panic when one of my coworkers informed me about the harmful effects of fresh paint on small animals like my cat. Apparently some of the chemicals released from the paint are known to cause SEIZURES! I immediately panicked as I had left my cat upstairs — although he was away from the living room and dining room, he was without an open window. I was just about to hop on my bike and frantically pedal home in the middle of the work day, when Erlend called to say that his lab had ended early and he could go and check on the cat. Turns out the cat was fine and completely unaffected by everything that was going on… but still. In my defense, it did smell awful in there. Because why does paint smell so terrible in the first place? Is it because its made of such toxic things? Which is ridiculous, considering that we cover almost every building with this stuff. And to think that I even made an effort to use water-based, low-to-no VOC paint! Good god, if this is what the environmentally friendly stuff smells like, what does the unsustainable, oil-based paint smell like??? These meringues were actually borne of me trying to rid the damn house of the paint's toxic chemical smell. Sometime during the first night (yep, the night in which us fools had all the windows open in sub-freezing weather), Erlend and I were cooped in our paltry attic bedroom with scarves tied around our faces to block out the cold and the smell, I decided that it would be a good idea to bake something to combat the stench. I whipped open my fridge and saw a pile of leftover egg whites from these burnt caramel orange custards. And what else can you do with a jar filled with leftover egg whites besides meringues? I added a couple more extremely fragrant ingredients like orange blossom extract and a whole ton of melted chocolate and voila! 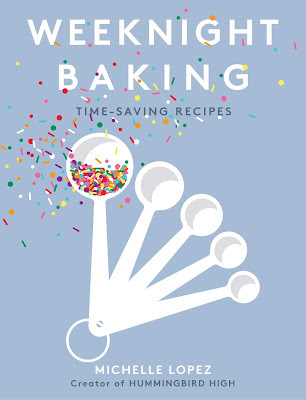 In no time, the wonderful, sugary smell of baking meringues was filling the air. These guys were a lifesaver. Orange blossom water is an extract made from the flowers of orange trees. It's traditionally found in Mediterranean and Middle Eastern cuisine. I purchased my bottle online, but they're also available in specialty culinary stores like Williams Sonoma or Sur La Table. Still can't find any orange blossom water? Feel free to sub in 3/4 teaspoons orange blossom water with 1 teaspoon vanilla extract. Boom! Vanilla meringues instead. 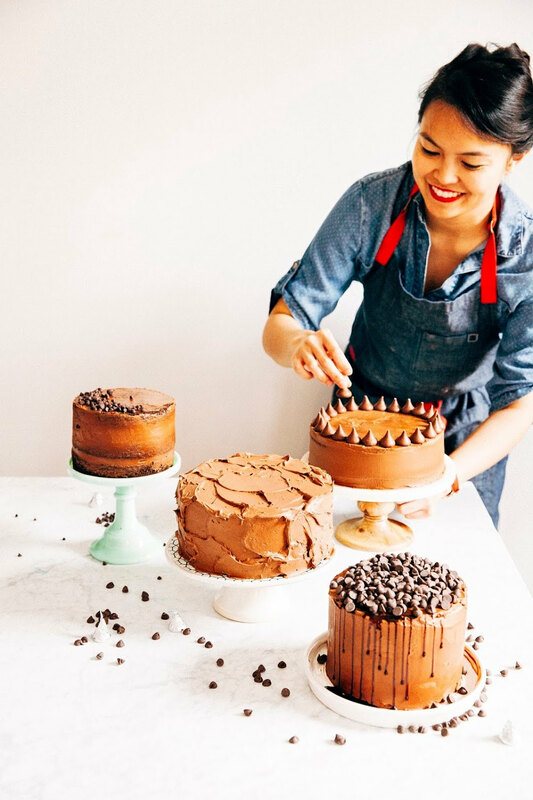 You're a baker now. 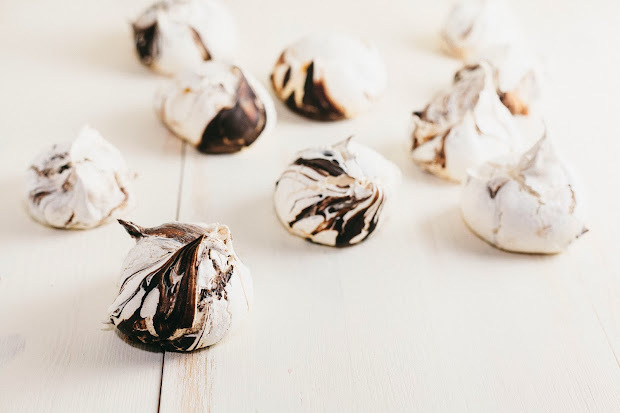 Make sure your chocolate is completely melted and cooled before drizzling it on top of the meringues — chocolate that's too warm will prevent the meringues from holding their shape and baking properly in the oven. Melt 4 ounces finely chopped bittersweet chocolate in a double boiler or a heatproof bowl placed on top of a pot of boiling water. Stir occasionally with a rubber spatula until melted completely, before setting aside to cool completely on a wire rack. Preheat the oven to 275 (F). Prepare a baking sheet by lining with parchment paper or a Silpat mat. Place 3 large egg whites in the bowl of a freestanding electric mixer fitted with a whisk attachment. Whisk on medium speed until soft peaks form. While the egg whites are whisking, whisk together 3/4 cup granulated sugar and 2 tablespoons confectioner's sugar in a small bowl. Once soft peaks have formed, slowly stream the sugar into the egg whites, before adding 3/4 teaspoon orange blossom water and 1/2 teaspoon white vinegar. Once all the ingredients have been incorporated, increase the mixer speed to medium-high and continue whisking until the meringue is glossy and holds stiff peaks. Once the meringue is stiff, drizzle a some cooled chocolate (from the 1st step) on top of the meringue – DO NOT MIX IN. Unmixed chocolate drizzle is what gives the meringues their interesting swirls. Use a 3-tablespoon sized cookie dough scoop to portion out a meringue onto the prepared baking tin. Continue drizzling chocolate over the meringues before scooping until all the meringue batter is used. 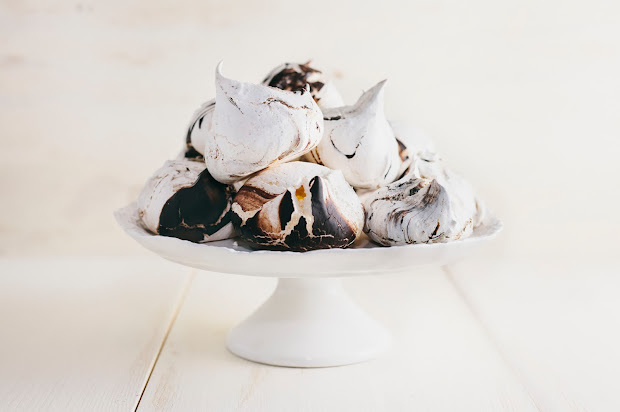 Bake meringues in the preheated oven for about 50 - 60 minutes, or until the bottom of each meringue peels easily away from the parchment paper. 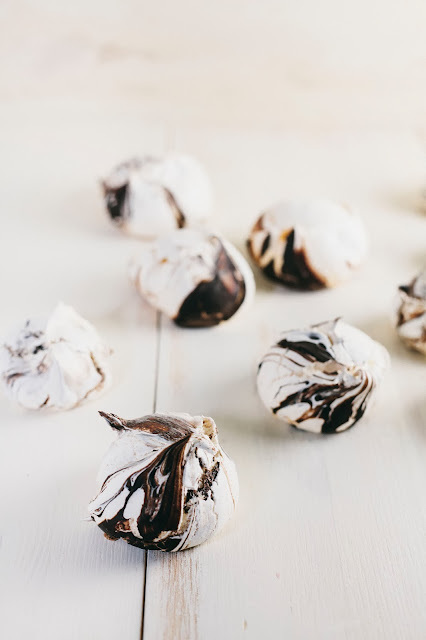 Remove tin from oven and place on a wire rack, allowing the meringues to cool overnight uncovered on the wire rack in a dark, dry place. 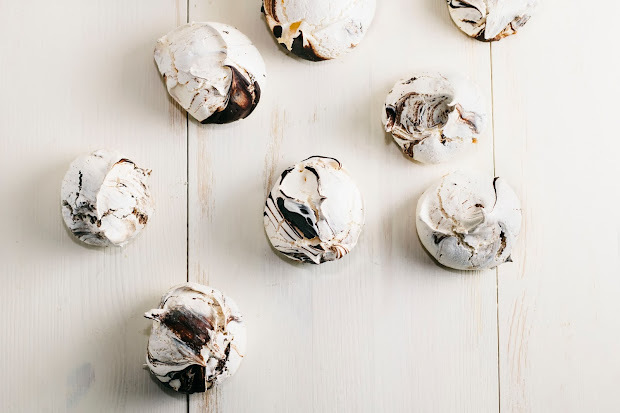 I have some egg whites lamenting in my fridge right now, I was going to make plain old chocolate meringues but these look like an interesting twist. Love the marbled effect, very eye-catching. Yay! Congrats on the first renovation!